Being Librarians this debate also happens along side the entire plane thinking Eve and Flynn just joined a very noisy mile high club because Librarians is so very good at keeping the zany always present even when delving into hard decisions. But also then dodging the hard decisions because, ultimately, they are Librarians which means they’re brilliant. And if there are only bad choices then it’s the Librarians who find yet another way – because they’re Librarians and that’s what they do. And I like that. This isn’t a grim and gritty series of terrible choices people have to make for the sake of the greater good. This is a show of brilliance and awesomeness and silliness. We’re not going to spend several episodes all sad and angry because they’ve had to kill a plane full of people in order to save the world – they’re going to save the world and the people. Because this is Librarians not Game of Thrones and not even Doctor Who and that’s fine. So many shows feel that they have to go dark and gritty if they’re going to be a “serious” show – well not everything has to be serious and good and meaningful doesn’t mean dark and grim. So, yes, let’s do this. Let’s save the world without dark epic sacrifices and antiheroes et al. By a series of classic Librarians events (which is so much fun), Flynn ends up alone in a Lewis Carol world having to confront some serious questions about himself. Including all of those points the Librarians brought up against him: how he keeps expecting people to reflect himself, how he doesn’t respect other people’s opinions – and how his own insecurities leads him to put up this huge façade of overconfidence which is both intimidating and makes him very hard to approach. I like this whole scene even if it is a little contrived and dubiously coincidental because it pokes a lot at Flynn’s character. Would Flynn necessarily accept the views of his fellows that he has flaws? Probably not. Would he accept a magical test that forces him to admit the truth? Probably; it’s something more objectively true, something he can’t just dismiss as lesser minds being less. It’s also useful because of, ultimately, what the whole test is about: who is worthy to take the Eye of Ra, a vital, powerful artefact that is essential in the last battle. They don’t need to test knowledge or skill, because any Librarian would have that- but self-awareness? Ability to see one’s own flaws and past one’s own ego? Now that I can see as a major issue for Librarians and something that would need to be tested before giving them this artefact. Flynn ends up with the Eye of Ra and some important life lessons – though part of his running off alone also comes down to him wanting to protect Eve: both because she is the only Guardian and because of his love for her. Which leaves us in an interesting place at the end of this episode. 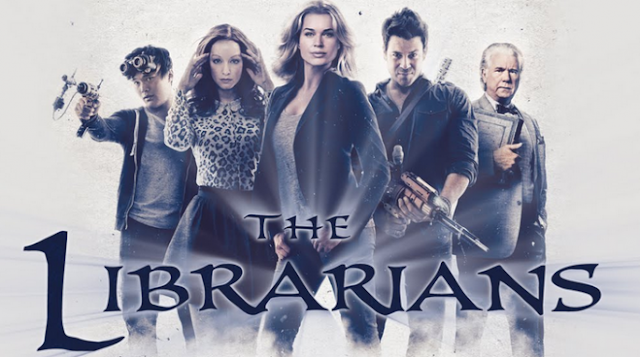 From the very beginning of Librarians I’ve always said that the worst episodes generally came when Flynn was with the group. Flynn tended to take over, Flynn tended to make everyone, except maybe Eve, into his sidekicks. And the show seemed to recognise this by repeatedly finding reasons why Flynn would separate from the group. This episode presents us with 2 alternatives to this for the future. Either a future where Flynn learns more and more how to play well with others, how he learns to become one of a team rather than a leader and sidekicks which would create a whole new dynamic. Or he will sacrifice himself to use the Eye of Ra and remove himself from the equation entirely. Both are definite ways forwards which could lead to very different dynamics from the whole show. We also have the ongoing debate of whether they can use magic or not. Jenkins I still leery of using magic – but Cassandra and Ezekiel both point out that they use magic all the time. But Jenkins draws a difference between magic that has been tried and tested repeatedly and brand new magic – but isn’t that a complete argument against progress and all new things? I like that this debate isn’t just going away and is still underpinning the season as an ongoing theme. I normally don’t enjoy episodes with Flynn but I liked this- because it directly addressed why I don’t enjoy the episodes that focus on him and are paving the path to him being a Librarian rather than THE Librarian.